While The Irvine Spectrum takes its architectural cues from Spain, The Marketplace seems to take theirs from Tetris. The sprawling complex is built on variations of one single shape: the cube -- painted monochromatically in single shades of either purple, terra cotta, or adobe. The result is an Orwellian uniformity such that the only thing distinguishing a Home Depot from the Buca Di Beppo is the sign that reads "Home Depot" and "Buca di Beppo." So when Taco Rosa opened its second location here, I was surprised that Big Brother allowed it to do what it did to the sullen box that was previously occupied by the failed chicken stand, Koo Koo Roo. They put up black awnings that serve no other purpose than to break the rectangular monotony of the structure, and installed looping wrought iron lattice work and brass lamps to further reclaim a sense of originality otherwise cast adrift in a sea of sameness. Inside, the space is equally un-Irvine, with a Manhattan polish and sleekness not seen here since French 75 Brasserie classed up the neighborhood a few years ago. Above the entrance, willow sticks are stacked in rows as roofing. Deep inside the restaurant, tables occupy a hidden alcove with drawn drapes for a touch of class and romance. In a noisy bar straddling a comfy patio and the waiting area, margarita glasses dangle underneath a thatched roof canopy. Meanwhile, in the stark white showroom of the kitchen, uniformed cooks fall over each other in a space crowded with grills, tortilla presses, and a melted chocolate fountain. Noticeably absent are the inane props and chotzkes usually found at a typical corporate Tex-Mex chain. There isn't a single sombrero or Texas license plate tacked up on the wall. The food follows suit, with dishes more refined than those sold at the On The Border just down the road. 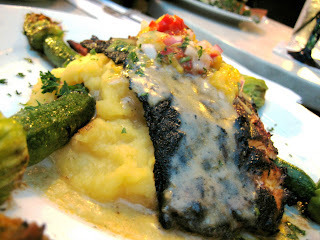 Take my favorite dish called Salmon Acapulco ($17.00), which I first tasted at the original Taco Rosa in Newport Beach -- a restaurant which was already well-established by the time Joy and Christian of OC Mexican Restaurants introduced me to it. In it I found not a trace of refried beans or melted cheese, which is one of the reasons why I love it so much. Another reason was how it's cooked. A slab of salmon steak was broiled over flames, blackened until it attained a smoky and charred crust, but with a center still butter-soft and silken. It's the sort of flavor only a roaring beach bonfire can produce. Before serving, the fish was slathered in a papaya butter sauce and some salsa. Then it's draped over a mushy bed of pureed acorn squash as sweet as candied yams, as smooth as apple sauce, and as thoroughly addicting as the two combined. The best part of the dish, however, were the mini-zucchinis and their blossoms. Roasted to a tender-crisp, each verdant spear had a refreshing bitterness that simultaneously awakened the palate and complimented the succulence of the salmon. The wilted blossoms, in particular, instilled in its ruffled petals the very spirit of the partnership between flower and fruit. After tasting it in this dish, to continue to eat zucchini without it is to watch Astaire without Rogers, listen to Simon without Garfunkle, and laugh at Charlie Brown without Snoopy -- each is full of substance on their own, but lacking a certain panache and vitality without its companion. 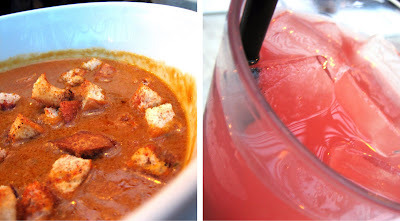 Another knock-out dish was Taco Rosa's take on Lobster Bisque ($5.00). Murky with the deep crimson color of the creature's carapace, this was a concoction so seductive, so boldly creamy and powerfully spicy, it coated my spoon like Indian masala gravy and attacked my mouth like Montezuma on the warpath. Although this was a soup that isn't exactly Mexican, it was just as convincing and impressively sultry as Catherina Zeta Jones when she plays one. By this time, the food was playing my tonsils like maracas. A tall, sweaty glass of Watermelon Agua Fresca ($2.00) provided a refreshing respite. I took a long drag on the straw and a surge of the chilly nectar cooled my throat. All the while, the crispness of the watermelon juice and its cold cubed chunks conjured images of summers on the back porch, Slip 'n Slides, and swinging hammocks. Surprisingly though, a few bites of their namesake dish left me unimpressed. Lobster; Lump Crab; Carne Asada; none of their tacos ($3.50 each) possessed much in the way of flavor or heft. It only goes to confirm that at Taco Rosa, it's better to order outside of the border and out of the box. Ya gotta remember, Elmo, you're still in Irvine, so maybe they desaturated the "common fare" (tacos, etc.) so the cube-loving drones wouldn't trumpet the famous OC "eeeewwwww!" too loudly. Nice descriptions of the salmon and watermelon fresca. With the exception of Chic-fil-a and IN N OUT, there is NO good food in the Tustin Marketplace. Its God Awful. for $2.00 you could have driven back to Carintas Los Reyes and had some great flavor and saved your money! Yeah, I'll be skipping those tacos next time. Tacos should not be sold for more than $2.00. Correction. With the exception of Chik-fil-A, In-N-Out, Taco Rosa (though not for those tacos), and French 75, there's NO good food at the Tustin/Irvine Marketplace. Sounds pretty good. I'll have to try it sometime. Pictures of the exterior at my site but I think I will have to get some updated ones. Have a new report on their breakfast coming pretty soon. I really need to go back to the Newport location and get some better pictures so I can do my review of the place. Like you, I like the occasional "out of the box" thinking for Mexican food. No, I don't want beans or cheese or even corn tortillas... this time. Thanks for giving me a view of the Mexican cuisine a la Tustin. Save a watermelon drink for me! I'm surprised you hadn't tried the Salmon yet. Can't wait to see what you'll show us on Taco Rosa's breakfast. That's a hilarious remix. Funky! Shoulda used it for the video. I like the Newport Beach location a lot still. It's got a certain charm, being so out of the way. At least for me. This Taco Rosa I see everyday on the way back from work. I think you'll like the place. Although I feel funny paying more than a few bucks for Mexican, this place is worth the money if you veer away from the stuff that you can get better and cheaper elsewhere. Still, there's no cheese crisp. Elmo, great piece of writing. I especially liked your opening paragraph. Although I'm normally a Horchata guy, that watermellon drink looks delicious. Looks yummy! I wan to try this place next time we visit. This was on my list of "want to try" ... great review. I am going to have to get over there (on the other side of Irvine, LOL!). Oh, I've tried the salmon before. I was just making a joke about how I'd have to try Taco Rosa sometime. Horchata was in fact the other choice of Agua Fresca they had that night. But since I've overdosed on it since every supermarket started selling Kern's Horchata, I opted for the watermelon. You gotta try Kern's Horchata if you haven't...it's quite good! Finally us Northparkers get a decent upscale Mexican place, while Taleo wows em south of the 405. AH, I had a feeling you were joking, but I wasn't sure. OF COURSE you've had the salmon. By this time, you must have had everything they cook, and some items that are still in test phase! Just went today to see what the hype was all about. Unfortunately, I was disappointed. It wasn't bad, but not great either. Lobster bisque was good and so was the little salad/appetizer thing that they give you while you wait for the food. The wife ordered the Salmon, but I don't know, it was nothing special. I ordered the carne asada burrito, which wasn't bad. A bit bland. Chips and salsa were a disappointment since most of the chips were all broken up. They were out of the watermelon agua fresca so I ordered the horchata, which I didn't like at all. The first glass I had was too watery and the second one was too grainy. I think, though, what might have ruined the entire experience was the service. I hardly ever complain about service, but our server wasn't very competent, and I couldn't ignore it. First warning sign was the fact that he took the order of the people (some kids) sitting literally right next to us who had come after us. Strange. I think I'll visit again to try the other items, but when I've saved up enough money. In the mean time, I'll stick to the whole in the walls. Digital Macro rocks! So does upping the ISO when the light is low like at this resto. Thanks again for the tips you gave me. Aww. Sorry it let you down. I had heard about the problems with the service, and I was about to pounce on them if I saw what I read in an earlier review on Chowhound which said the same. But I must have gotten lucky because my server was charming, professional, even efficient. The only mark against him was that he didn't memorize the agua frescas of the night. He had to go find out and come back when I asked. That carne asada though...bland as boiled meat. I went to the new Taco Rosa at 7 p.m. Friday and waited 45 minutes for my table. About 10 minutes after we were seated, another couple plopped down next to us, and one of them said: "That wasn't bad at all. That was like, what, 20 minutes?" D'oh! Do not go to Taco Rosa at peak hours because it is very busy! OK that said, we enjoyed our meal very much. You're right, the interiors are much more subdued than the Taco Rosa in Newport. My baked carnitas pibil was very good, as was my husband's burrito. The service was great, prices reasonable. 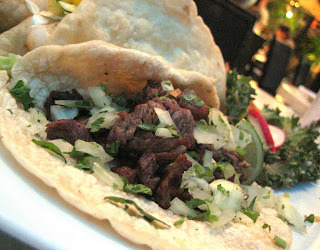 Yesterday, I went to a new taqueria near my house in Costa Mesa called Cabo Grill. It was cafeteria Mexican ... underscored how much better Taco Mesa and Taco Rosa are. Yup, just push down on the top part of the wheel until "ISO 50" shows up on your screen. Another push and it increases the exposure level. "ISO 400" is what I used for low light environments. Very grainy though. Not as good when you need high resolution. But then, you don't need any of this when you've got a Canon Digital Rebel ST!!! I'm not worthy! I'm not worthy! Their service is still crazy inconsistent isn't it? Everyone there seems pretty green and so unsure of themselves. I can't get over how lucky we got, on that Wednesday night we went. The wait time was 10 minutes as promised. Although I would've liked it if they gave us a choice between the patio and the dining room, instead of being just led to the patio. Ooops, sorry for my late comment Elmo, I just wanted to say that you made my throat parched like the desert in Death Valley, and now I want me one of those frescas! I hope you don't mind, but I read that frescas part over 5 times. i love the video addition! too cool, too cool. Great blog! I'll be back for more..
By all means! Read and repeat! But my goodness, that agua fresca is something else. Refreshing, not too sweet. Perfect. Thanks! I've always found the Marketplace odd, don't you? Like it's unfinished, incomplete. Glad you found me! Stick around, I've got more up my sleeve! I was not impressed with the food at all. After hearing rave reviews I was expecting a lot, but after eating the only reason I would go back is to have drinks at the bar. They ran out of the Lobster Bisque? How do you run out of something at a restaurant? Just make more (I thought) so that started things off wrong, then nothing really caught my mind so I ordered the carne asada plate, and I got a fatty piece of meat with no flavor. Yup, I'm not surprised you didn't like the carne asada. I thought it was bad, but the price tag makes it sting a little more. I think every review I've read has said that their carne asada is horrible. I agree. Too bad you couldn't taste the Bisque...that was some good soup. Overall, the restaurant is still finding its bearings...it's got service issues (although I apparently got very very lucky), and food issues, but overtime, it should smooth out. Now if only someone in there will listen to us about the carne asada. And those tacos are bland too. "How do you run out of something at a restaurant?" They run out because they are victims of their own success. So many people order the lobster bisque and they only have a finite amount of room to keep the ingredients in the back. And I don't think I've ever had the carne asada plate there. I've noticed that when people go to Taco Rosa for the first time they tend to order items they are used to ordering at other Mexican restaurants but you've gotta try some of their unique things. Anyways, Elmo, I don't know how you do it. You've got more comments here than in all my Taco Rosa posts combined. And I'm only responsible for four of the comments in this post. Hi, first time to your blog. I was attracted to the way you describe the food. It kinda gives each dish its own personality and how it affects you. :) Makes great reading! As I walking out of the restaurant with my friends, I said, "Now that's a Mexican restaurant that you shouldn't order Mexican food in." They agreed. They liked my dish but not theirs (enchilada and tacos). As far as comments go, I'm responsible for 7 of 'em, not including this one, so I think it just appears that this post got a lot. But remember, if it weren't for you, no one would be talking about Taco Rosa the way that people have! Welcome! And thanks for the compliment. I had a lot of fun writing this post, and not just because I was at the Venetian in Las Vegas looking out the gorgeous hotel pool when I was scribbling it out on a pad of paper. big brother = the irvine company. hehehehehe. nice. I just found your site (through a google search for "the hat" and "oc weekly") and I'm so glad!!! I'm glad you got my joke! I'm not sure how many people looked at the hyperlink on "Big Brother". And welcome to my humble food site! Is Taco Rosa run by the guys that started and own Taco Mesa in Costa Mesa (19th St) and others? I see Taco Rosa flyers at the Taco Mesa locations. Is Rosa a slightly upscale Taco Mesa designed to compete more with the El Torito that they fled from? Yep. It's one and the same. I haven't even tried Taco Mesa yet, but if you do try Taco Rosa, bring money...and stay away from the tacos! the restaurant is still coming on it's first year. naturally for all resturants that are not a major chain it takes time to iron out the kinks. and the Alambre Taco is outstanding! i noticed one time i came in late and my food took forever so i just hand another awesome top shelf margarita(best you'll every try, just ask the bartender to make you whatever they recommend!) so i guess i cannot complain to much. Taco Rosa, become my new favorite place! Taco Rosa while it has great food and atmosphere for Tustin Marketplace, it does have the ruddest managers in town! After happily waiting 30 minutes to get seated on Friday night and all four members of our party eating a full meal and finishing our stories over our drinks, one of the managers HOVERED over our table with the not so subtle message "leave b/c we need the table". I swear I was taking a final sip of sangria when my glass didn't touch the table, but was swept away with a wry smile and "is there anything else you need". We asked him to stop hovering b/c we just wanted to finish our drinks and story so he nervously took two steps back to still send us his message. Upon leaving we let the other manager know how rudely we were treated and rather than offer an apology or even fake a good cop bad cop approach, he stated "well, what are you going to do about it?". Can he be serious or did he just treat his paying customers like we were at a highway bar in Nashua? This dump can't even pose like a high end eatery if they don't have common courtesy. 4 words... hair in my food. customer service was crap too. This place was absolutely horrible from the food, the service, and everything else that went along with it. Not a fan!